Most people wear face masks in an attempt to avoid catching a sickness. 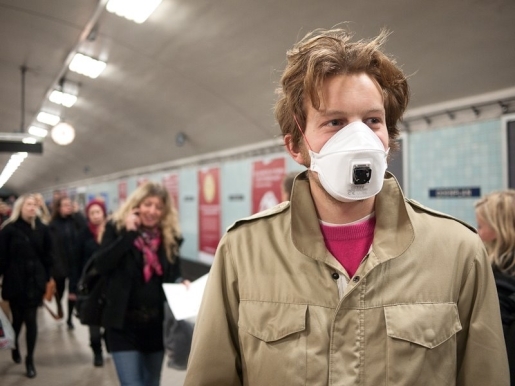 For example, the resurgence of the paper hospital mask thanks to the swine flu outbreak has brought a trend normally associated with Japan internationally. However, some people aren’t afraid of the H1N1; in fact, some people are looking to get their bout of swine flu over and done with as soon as possible. For you, there’s the INFLU mask, which is designed to get you sick. The brainchild of designers Michel Bussien and Erik Sjödin, the INFLU mask boasts that it improves your chances of catching the flu by several hundred percent. It does this by collecting the air around you and forcing it into the mask via fan system, thereby making you breathe the sneezes and coughs of everyone around you. It’s kind of like the grown-up version of chicken pox parties, since once you have the flu for that season, you won’t get it again. If everyone is going to catch swine flu, and they say we are, you may as well dictate the terms of your own illness, right? If an ounce of prevention is worth a pound of cure, could you call this a gram of provocation?